Bedfordshire Day Greetings From Mayor Dave! Mayor Dave Hodgson has wished everyone a Happy Bedfordshire Day, and declared that he is 'proud of Bedfordshire and proud that Bedford is the county town.' The Bedfordshire flag has been flying from Borough Hall all day and, at Mayor Dave's suggestion, the staff canteen has been serving Bedfordshire Clangers and Chocolate Toothpaste! "I'm proud of Bedfordshire and I'm proud that Bedford is the county town. The Council has been marking the occasion at Borough Hall with Bedfordshire Clangers and Chocolate Toothpaste for sale in the staff canteen, while our county flag is flying proudly outside the building." "Happy Bedfordshire Day! The flag is flying proudly once again at Borough Hall as we mark this celebration of the historic county of Bedfordshire, which coincides with John Bunyan's birthday today. 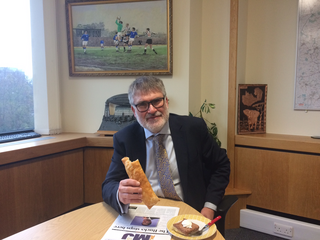 Thanks to the Borough Hall canteen team for fulfilling my request today that Bedford Borough Council should celebrate our county's big day by serving the famous Bedfordshire Clanger and Chocolate Toothpaste. These ones were from the excellent Gunns Bakery on Bedford High Street, which sells these local delicacies all year round!"